I like to make this giant Christmas Wreath Cookie recipe and use it for parties, as a centerpiece, as a dish at potlucks, or even as a gift. You can press the cookie mixture into a tube pan or Bundt pan and turn it over onto a regular-sized dinner plate. When it’s time to serve it, just slice pieces as you would a cake. How convenient is that? Yes, they’re messy to make and to eat. They’re as much a part of Christmas as any other cookie. But once I tried the giant cookie option, I discovered that it takes less time to make and I get all kinds of “oohs” and “ahs” – even though this recipe is uber-easy to make. The ingredients and procedure are a lot like other Rice Krispie Treats variations, but I increase the amounts by 50% from the original so it will fill the cake pan. Use vegetable spray or shortening to coat the inside of a tube pan or a Bundt pan. Set it aside. Measure out corn flakes. Pour them into a large mixing bowl and set aside. Set a large saucepan on the stovetop. Place the butter and marshmallows in the pan. Turn heat onto low. Cook butter and marshmallows together, stirring continually, until melted and smooth, about 3-4 minutes. Stir in food coloring. Remove the mixture from the heat. Use a wooden spoon to add corn flakes in 2-4 additions, turning over the cereal quickly to coat surfaces completely with each addition before the mixture gets too sticky. 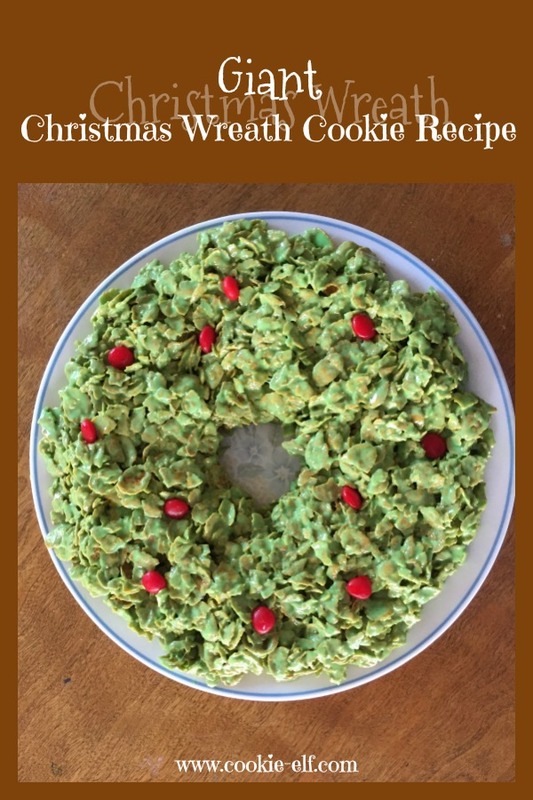 Make sure all cereal is coated completely or some parts of the wreath won’t be green. Moisten your hands with water and press the mixture into the prepared tube pan. Place a dinner plate on top of the tube pan. Hold it in place and turn over the tube pan so that the giant cookie inverts onto the dinner plate. Remove the tube pan. If the giant cookie looks too “perfect,” use moistened fingers to press the top of it lightly so that corn flakes spread out a bit. This way they’ll look more like evergreen branches. Press red candies onto giant cookie surface to look like holly berries. Allow the giant cookie to set either at room temperature or in the refrigerator. To serve, use a sharp knife or a serrated knife to slice the giant cookies into pieces. Lift out pieces with a pie server. You can melt butter and marshmallows in the microwave rather than on the stove top. Cook on high for 30 seconds at a time and stir. Repeat until mixture is smooth. You can substitute miniature chocolate-covered candies, like M & M’s, for the red hots. Tips for Jumbo Cookies: Yes, bigger can be even better!